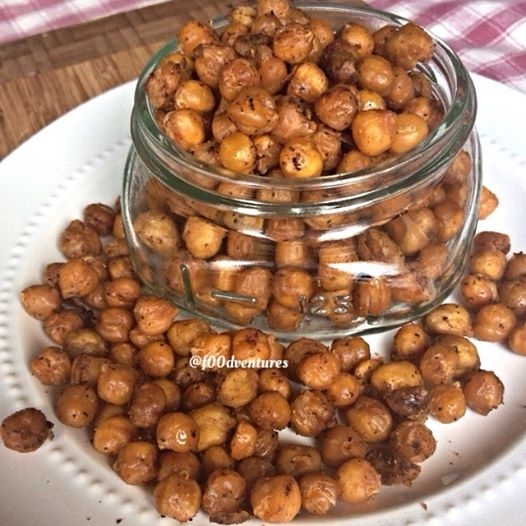 Whenever I'm craving a salty snack, I make these chickpea poppers. They are a great nutrient dense snack that are full of protein, fiber, folate, and phytochemicals. Make a great gluten free, vegan snack! combine beans with olive oil and desired seasonings (see savory and sweet options below). Bake at 400 degrees f in a parchment paper Lined glass container for about 45 min until crispy. For a savory snack, try black pepper, curry, Italian seasonings, bbq seasoning, or garlic powder. For a sweeter treat, try a mix of cinnamon, nutmeg, and coconut sugar.